In the wake of growing passenger numbers (more than 6% in 2017), Air France turned to Idemia for an innovative solution to securely identify passengers while decreasing boarding times. The result is a world-first that has already been successfully tested at Paris-Charles de Gaulle Airport. There is an increasing pressure on operators in France to tighten identity checks as part of a complete review of all security measures. On top of that, Paris is five years away from hosting the 2024 Olympics with construction work for a new train service between the center of Paris and Charles de Gaulle Airport well underway. Pressure is mounting to find new ways to process passengers. Check-in: The passenger’s facial image is captured from the scanned travel document during the identity verification at any check-in point (desk, kiosk, bag drop). The facial biometric data is encrypted into the barcoded boarding pass (either printed or digital). The process is automatic and does not require any additional input. Bag drop and boarding: Using MFACE, Idemia’s most advanced facial biometric technology, a live image of the passenger is captured during bag drop and boarding and compared with the data on the boarding pass. This automatic and highly accurate identity verification process is considerably faster than the manual ID checks by airline personnel. 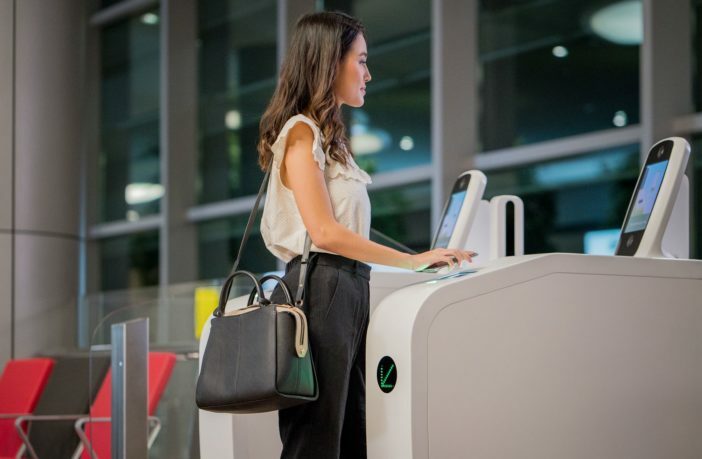 Idemia’s biometric boarding pass is a major breakthrough for the air transportation industry and an all-around game-changer. It significantly reduces the processing time of each passenger when identity checks are needed. It also integrates Idemia’s leading facial biometric technology to ensure highly accurate technology behind the whole approach. A major advantage is that passengers’ biometric data is not stored in any database. The facial data is both stored and encrypted within the boarding pass barcode, which ultimately means that all passengers are in control of their own biometrics at all times. This groundbreaking solution is the perfect alternative for passengers who do not want to store their biometrics in a centralized database and for countries that do not support the storage of biometrics as part of their privacy requirements. Following successful operational tests targeting passengers of a specific destination, the second phase of the project was launched at the beginning of 2019. This included the integration of a digital identity check into the Air France check-in mobile app; and the deployment of innovations designed by the in-house Idemia research team (UX, On the move recognition, liveness, 1/N newest Algorithms). Together with Idemia, Air France and Paris Aéroport overcame technical challenges, as well as coordination and integration issues to deploy what is the first building block to the deployment of a new end-to-end, seamless, passenger-centric journey. For further information about Passenger Terminal Expo and to register for the event, click here.